Maybe you are migrating an existing MySQL DB to RDS and its setup using the MyISAM DB engine. AWS recommends to only use the InnoDB storage engine so if you have a MySQL DB that has MyISAM you should consider converting those tables to InnoDB. Its okay if you do this after moving to RDS. 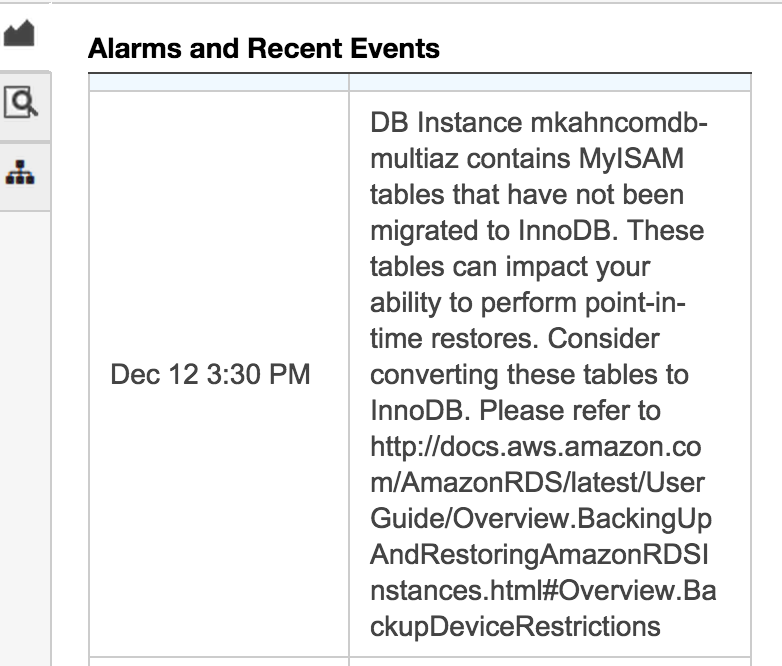 AWS mentions that keeping MyISAM tables may lead to unreliable behavior when restoring from backups as MyISAM does not support reliable crash recovery. step was to connect to my EC2 instance in the same security group as my RDS DB to use the mysql client to modify the MyISAM tables. So now just run the above MySQL commands to convert each table to InnoDB. After converted in the event of a DB crash you should now be supported by the InnoDB DB engine reliable crash recovery feature.